WASHINGTON (Jan 31): The US Federal Reserve is expected to keep interest rates unchanged on Wednesday in its first policy decision since President Donald Trump took office, as the central bank awaits greater clarity on his economic policies. Trump has promised a large infrastructure spending program, tax cuts, a rollback of regulations and a renegotiation of trade deals but has offered few details or a timeline for their rollout since his victory in the Nov 8 election. The central bank's latest policy decision is scheduled to be released at 2pm EST (1900 GMT) on Wednesday at the conclusion of a two-day meeting. Fed Chair Janet Yellen is not due to hold a press conference. The policy decision will come a week after Yellen underscored that the US economy is near full employment and warned of a "nasty surprise" on inflation if the Fed is too slow with its rate hikes. Economists polled by Reuters have all but ruled out a rate increase at this week's meeting. 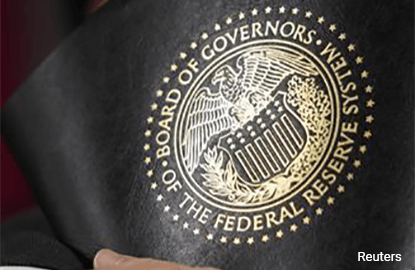 Investors next see an interest rate rise in June, according to Fed futures data compiled by the CME Group. The Fed raised its benchmark interest rate at its last policy meeting in December, the second such move in a decade, to a target range between 0.50% and 0.75%. It forecast a further three rate increases this year. Despite encouraging US economic data, Fed policymakers are currently hampered in assessing how quickly inflation might rise until they have more information on Trump's economic plans. "At the moment there's incredible uncertainty surrounding fiscal policy and the potential for stimulus and the composition of that," said Paul Ashworth, an economist at Capital Economics. "The Fed can't react until it knows what to react to." With the US economy already bumping up against full employment, Trump's promises on fiscal stimulus and tax reform could quickly spur higher inflation as would imposing tariffs on Mexican imports. Other policies, such as an immigration crackdown, go against what the Fed argues the US economy needs to grow over the long term. US stocks fell on Monday after Trump curtailed travel and immigration to the United States from seven predominantly Muslim countries. The S&P 500 index is still up roughly 6% since Trump's victory and the robustness of the domestic economy makes the United States increasingly divergent from Japan, the euro zone and Britain, none of which are expected to raise rates anytime soon. "Changes to the ... statement should be mostly upbeat," Roberto Perli, an economist at Cornerstone Macro LLC, said in a note to clients. The US unemployment rate is 4.7% and business investment has improved, despite a slowdown in fourth-quarter economic growth caused mostly by a widening trade deficit. Consumer spending, which accounts for more than two-thirds of the nation's economic activity, rose solidly in December, according to Commerce Department data released on Monday. In the same report, the Fed's closely-watched inflation gauge also edged up to 1.7%.